Our ever popular Jack the Joker fundraiser continues this Sunday night in Crotty’s Bar where the jackpot is €3000 as on Sunday night Rosie Cosgrave was drawn out of the drum and chose card number 25 which when turned wasn’t the joker but she did win €50. Jim Egan was drawn out twice and won €25 each time. Our senior hurlers play An Rinn in the County Championship this Sunday evening in Bushy Park. Both of our Junior Hurling teams were in Championship action last weekend. Firstly on Saturday night our Junior C hurlers took on Shamrocks and at the end of an entertaining game it was our opponents who emerged victorious. Then on Sunday night our Junior A hurlers travelled to Bushy Park to take on Ballinameela. On a sweltering hot night the team played some great hurling only for our opponents to hit some late goals to win by 4 points. This weekend our Junior C hurlers play Modeligo in Fraher Field on Saturday afternoon at 3pm while our Junior A hurlers take on Tourin later on Saturday at 7pm in Cappoquin. There was a fantastic turnout in the club grounds on Saturday morning last for the launch of our Healthy club initiative. Our Health and Wellbeing officer Eamonn Cashin had everything in place to ensure the launch was such a success, whilst Kieran O’ Connor kept things moving along in his normal efficient way. We now look forward to ensuring the initiative is a huge success and delivers benefits to as many of our members as possible. Healthy Club project aims to transform GAA clubs into health-enhancing hubs for their communities. Flagship Healthy Clubs such as us are now in every county of Ireland. So far, over 12,000 people have benefitted from physical activity programmes and 50% of Healthy Clubs are now smoke-free zones. 1,000 people engaged with mental health and emotional wellbeing programmes. Over half (55%) of Healthy Clubs delivered healthy eating programmes targeting teenagers in particular. A. In association with Waterford Sports Partnership. This is a 6 week initiative and will run each Wednesday and Friday from July 18th and 20th at the club respectively. It will finish on Friday August 24th (Names, mobile contact numbers, and email adresses with an expression of interest will be taken at the launch). It will be open to committee members, coaches, former players, members of our community etc being the participants! It's all about inclusion. Along with the help of 2 Waterford Sports Partnership tutors this exciting programme will see 10 to 30 participants the chance to become healthier by getting on the move!! To register for this please contact Eamonn Cashin at rashercashin@gmail.com. B. Tobacco free Club from January 1st 2019 (Ban includes Cigarettes and vapes). We all want to maximise our health and our performance both on and off the field but with so many mixed messages out there about what we should eat and drink it’s hard to know what’s best. The Community & Health Section in Croke Park along with the Home Economics Department at St. Angela’s College, Sligo and leading sports performance nutritionist Dr. Críonna Tobin have developed a Recipes for Success toolkit – which is filled with tasty, performance enhancing recipes that are easy to make and aims to support GAA players and members in making the right food choices. This unique collaboration is about bringing together expertise from an array of sectors and is designed to respond to an identified need in GAA clubs for both educational and practical programmes supporting healthy eating for sport and the game called life. Workshop is open to both male and female. Ideal age group for the workshop is minor (U18’s) to U21’s. A series of talks will be organised for our adult and juvenile players, mentors and parents which we hope will give them the skills required for dealing with the many challenges people face in their every day life. We hope to see you at the launch this Saturday. Our ever popular Jack the Joker fundraiser continues this Sunday night in Crotty’s Bar where the jackpot is €2800 as on Sunday night Alice Marie was drawn out of the drum and chose card number 13 which when turned wasn’t the joker but she did win €50. Alice Marie and Carmel and Pakie Hurney won €25 each. 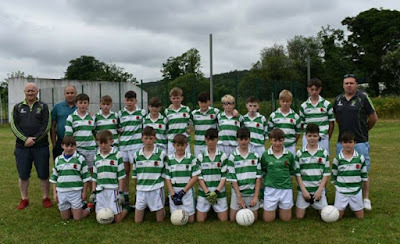 Our Junior C hurlers took on Melleray in the Western Championship on Saturday evening last in Bushy Park. As the match neared its conclusion our opponents held a narrow lead but great credit is due to our team as they fought to the end a well taken goal gave us a two point win. This weekend our Junior C hurlers play Shamrocks in Cappoquin on Saturday night at 7pm while our Junior A hurlers take on Ballinameela on Sunday evening in Bushy Park at 7 pm. On behalf of all in the club we would like to wish the Waterford Senior Footballers especially Stephen Enright, Brian Looby and Conor McCarthy the very best of luck ahead of their Qualifier game against Monaghan in Fraher Field on Saturday. The club are launching a very exciting new initiative, namely the GAA Healthy Club this Saturday 23rd June at 11am. This is a 6 week initiative and will run each Wednesday and Friday from July 18th and 20th at the club respectively. It will finish on Friday August 24th (Names, mobile contact numbers, and email addresses with an expression of interest will be taken at the launch). It will be open to committee members, coaches, former players, members of our community etc being the participants! It's all about inclusion. Along with the help of 2 Waterford Sports Partnership tutors this exciting programme will see 10 to 30 participants the chance to become healthier by getting on the move!! 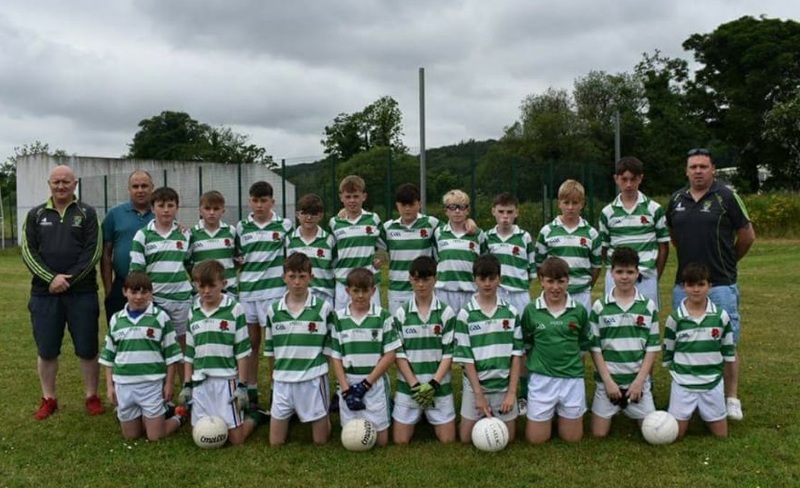 The U13's finished their football campaign with a County Final appearance against Gaultier at the Cappoquin GAA clubs grounds recently. On a beautiful Saturday morning the lads put in their performance of the year. Trailing by a point at half time the boys went out and gave it everything in the 2nd half but came up just short against what is a very strong Gaultier outfit. Football finished and the hurling kicked in a week later and our 1st game against Mt. Sion in Abbeyside. Our lack of hurling showed in the 1st half and we were losing 3-3 to 0-4 at the break. 2nd half the boys showed all the fight and spirit that ran Gaultier so close and ended up winning the match by the slimmest of margins, 3-10 to 4-6. Next up is De La Salle away so hopefully we can keep the momentum going and get another two points on the board. Best of luck to our own Kieran Cosgrave who qualified for the County Final in the U13 Hurling Larry Quinn Skills competition to take place this week. Our ever popular Jack the Joker fundraiser continues this Sunday night in Crotty’s Bar where the jackpot is €2600 as on Sunday night Anne Power was drawn out of the drum and chose card number 29 which when turned wasn’t the joker but she did win €50. Anthony O'Regan and Robbie Daly won €25 each. Our Senior Hurlers defeated De la Salle in the County league on Saturday last in Abbeyside in their final game of the league section. They have now qualified for the semi final of the league. TEAM: A. BERESFORD, J. ELSTED, S. O'HARE, J. BERESFORD, D. COLLINS, J. HURNEY, T. LOOBY, M. POWER, M. O'HALLORAN, S. DALY, T. MURRAY, S. WHELAN BARRETT, E. KIELY, M. FERNCOMBE, P. HURNEY. Also on Saturday our Junior C hurlers played Kilgobnet in the Western Championship with our opponents running out as deserved winners. This Saturday night we play Melleray in Colligan at 7:30. On behalf of all in the club we would like to congratulate the Waterford Senior Footballers on their fantastic win over Wexford on Saturday last. We especially congratulate Stephen Enright, Brian Looby and Conor McCarthy and wish them the best of luck ahead of next week’s game against Monahan. We also congratulate Michael Kiely and all the Waterford minor hurlers on their great win over Limerick in the Munster Championship last Sunday. Hopefully they can continue with their winning ways this Sunday against Cork and qualify for the Munster Final.